Fat Burning Soup -- Great for the Flu Too! (Dairy-Free) | Low-Carb, So Simple -- gluten-free, sugar-free recipes with 5 ingredients or less | Low-Carb, So Simple! This recipe is very quick and easy to make. You can prepare the soup if the hunger pang hit and you want something to eat pretty quickly, or during the flu you don’t have that much strength and energy to prepare a proper meal. Nothing prevents you from preparing the soup beforehand and storing it in an airtight container in the fridge for a few days. 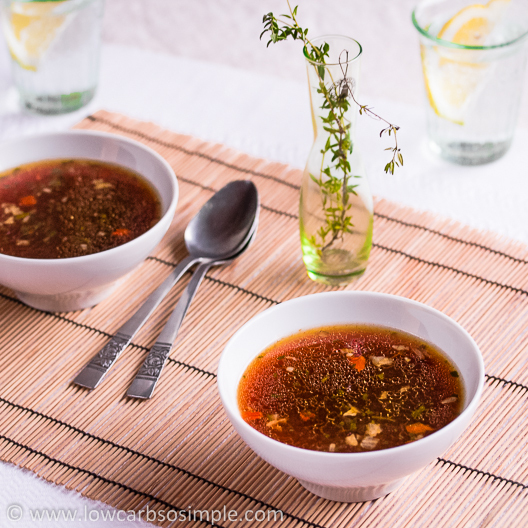 If you prepare the soup using bone stock, you’ll end up with extremely healthy soup! Bone stock is real health food. It’s good for the skin and joints, and it’s also very nutritious. Actually, bone stock should be everybody’s pantry staple. Home-made bone stock is the best. Try to get bones from grass-fed beef. Be sure to add a tablespoon or two of vinegar to the ingredients before you cook them. Vinegar helps release the gelatin and other important nutrients from the bones and ligaments. One note still about the stock or broth you are using: you know it’s good stuff if it reminds gelatin after you have stored it in the fridge. This is self-evident, since good-quality stock contains natural gelatin. When you heat the stock, it becomes fluid. What you should notice about the veggies: Just be sure that the soup vegetable mix doesn’t contain potato, beans, peas or other high-carb veggies. Neither should it contain anything additional, like starch or food additives. Herbs are perfect, though. In the first photo of this blog post and also in the photo below I’ve used dried borscht vegetables. They contain beetroot, which gives the soup a nice reddish hue. Moreover, the soup tastes really delicious! Heat over medium-high heat, covered, mixing once in a while. When the soup starts to boil, remove the saucepan from heat. The nutrition information is just suggestive, the real numbers highly depend on the ingredients used. In the calculations I’ve used bone stock and vegetable mix consisting of onion, carrot, turnip, leek and parsley. In fact, this recipe is developed half by me, half by my husband. Well, he was wishing for a warm, low-calorie soup for his under 800 kcal days. He started dieting and is now doing intermittent fasting having two under 800 kcal days per week. On the other days he eats normal, gluten-free and sugar-free low-carb food. So, I started developing a soup recipe from the scratch. There was some veal stock in my pantry. That would be a perfect base for my soup. The stock was commercial but made in a traditional way using bones, meat, veggies and nothing artificial. Later I tried chicken stock as well, which was also very good. I think my ultimate personal preference is veal stock, after all. I mean when there is no bone stock available. Usually I cook a huge pot of bone stock and freeze it for the future use. Since just liquid stock would have been too plain and bland, I wanted to add a handful of vegetables. I took a couple of tablespoons from a bag of dried soup vegetables and added to the stock. Very simple and tasty, giving you something to bite. I also wanted to add some cayenne pepper to give some boost to the metabolism and to give some warmth. When you are dieting, you easily feel cold. And when you have the flu, cayenne gives a nice kick and some taste for your taste buds which are numbed by the flu. I had suggested my husband to add extra virgin coconut oil to his diet to boost the metabolism, and he got the idea to add coconut oil to the soup. That was a great idea, the coconut oil gave the soup an exotic taste and some oriental touch. At least when I tasted the soup, I immediately was falling into oriental taste world. So was my husband. I have to confess that I ate a bit unhealthy food during the holidays. That, and all the stress combined caused me to catch the flu. This soup was great in order to make me feel better and to soothe my throat and blocked nose. Moreover, coconut oil is antiseptic and helps zap the flu bugs. You can vary this soup endlessly. Instead of dried soup vegetables you can naturally use a handful of finely chopped fresh veggies. Green bell pepper, celery stalks, white cabbage, broccoli, onion all are great. Just count the carbs, if you need to follow a diet which is very low in carbs. Remember also herbs. Many of them have healing properties, many of them are diuretic. You can also spice up the soup as you wish. Crushed garlic beats the flu bugs and helps you also recover from the flu. If you follow strictly ketogenic diet, you might want to notice that there are approximately 2 grams of carbs in each garlic clove. But after all, that’s very little. Can this soup be freezed for future use? Hi, just found your site! I’m anxious to try your recipe, but I’m intrigued by your husband’s 2 low calorie days each week with intermittent fasting. Can you share more details??? Hi Cheryl, at that time, my husband ate normal low-carb food for those 5 days and then basically had 2 calorie-restricted days (I think Tuesday and Friday) when he ate only soup/broth and then maybe one or two protein bars to get altogether that 800 kcal. That worked very well for him. It says to serve immediately, can you make enough for the week and refrigerate it with the same results? Hi, yes, you can do that. its very interested but i want to ask you, per day how much times i use it for how long time i take this? Hi and thanks for your comment. I would recommend consuming it maximum one week in a row, then have a few weeks break. Notice that you shouldn’t take this soup as the only food, but include also other low-carb foods in your daily diet. However, you should cut the calorie intake especially if you try to lose weight. If you aim at rapid weight loss, cut the calorie intake drastically, though it’s good to eat enough protein to feel sated. The daily amount quite much depends on your individual tolerance, especially how well you tolerate coconut oil. In any case, I wouldn’t recommend more than 4 tablespoons coconut oil per day. I want to lose my tummy. What kind of food to ate to diet? Low-carb high-fat diet is especially good for losing tummy fat. I like to knw more about the burning of fat soup. Just follow the directions. If there is something particular that concerns you, I’m happy to help! A traditional and healthy soup. Easy to make too. Thank you. Thanks for your comment, great to hear that you like the recipe! I like your post and i want to try how to make it….can you pls put into vedio…thanks. Thanks, I’ll take a video an add it to the post. Might take some time but I’ll do that! do u have low sodium recipes?????? No. I use pleeenty of salt, unrefined sea salt. Stay away from pure sodium chloride. What brand dried soup vegetables don’t have potatoes, etc.? What did you use? ThankS! I’ve used one Finnish brand. Have you tried to find dried vegetables separately, i.e. dried carrots, dried onions, dried herbs, etc.? I was looking at the Knorr dried soup veggies, but it doesn’t seem to be appropriate. i would rather drizzle the vco after cooking and boiling the soup. Yes, that’s also an option! Very interesting and helpful ideas. Thank u. Did u know that 3 glasses of Green Tea a day boosts metabolism and helps in weight reduction ? There are millions of health tips that can help weight loss much faster. I am a fitness freak and i read lot of health related books digitally on my ipad using the Magzter App. Yes, there are many ways to lose weight and fat fast. I’m also a fitness freak and have been studying (and trying!) different diets for over three decades. Nowadays, I prefer low-carb lifestyle and personally I love green tea! I drink it several mugs every day. Not because of weight loss (I don’t need to lose weight), but because I just like it and it gives me energy boost. Thanks, yes, it’s helpful for dieting.